Career change resumes differ from chronological resumes. The chronological resume format is good for applicants with steady career path. But you will want to write a functional resume format to show your transferable skills. Writing career change resumes need much more efforts than writing chronological resumes. There are at least two reasons. First, you have to know the needs of your target company and transferable skills that you can offer them. Next, your application has to compete with cover letters and resumes of the incumbents. The biggest challenge for you is how to get called for an interview while job seekers from the industry are hard enough to get noticed. Finding out what the employer want from employees is the first step. You may want to learn from different job openings and start building a network with people in the industry. From this approach you’ll discover critical qualities required for the new field. Once you know the critical qualities you may dig up your transferable skills. Transferable skills are skills developed in earlier career that are still applicable to a new career. For example, an engineer may apply problem solving skills in a management career. You can then start writing a résumé using the right format. Two common resume formats are functional and a mix of functional and chronological formats. While a chronological resume shows relevant work experience, a functional one focus on smoothing over gaps in your work history. Let’s say you want to apply for a job with no earlier work experience. Instead of chronologically listing your work history you want to list them by functional skills, which are applicable across industry. Result and team oriented accountant, skilled in all aspects of client management within Fortune 500 corporations’ environments. Based on your understanding of employer needs, use the example for developing a qualification summary. Write highlights for every transferable skill group. And expose your work history in a simple and clear listing at the bottom of your résumé. A combination resume is a chronological resume with a qualification summary lead. In a situation where transferable skills can easily match the new career, a combination resume is your best choice. This format allows you to show most relevant skills and satisfy the needs of hiring managers for your work history. Display important qualifications at the top of your résumé and you’ll entice recruiters to read further. You may want to incorporate your career objective, key skills, major accomplishments, and relevant training into the qualification summary. Write your accomplishment section in several concise sentences. At the professional experience section you can create a chronological history of experiences along with a brief summation of responsibilities. In the last section, don’t forget to add relevant training and education. Career change resumes are personal sales letters and cover letters are pre-selling letters for the resumes. Cover letters for career change work by briefly introducing career change resumes. To make it works, you have to find out the last reason recruiters would want to read your resumes. Writing a well-package summary of relevant skills and achievements is a good way to get noticed by hiring managers. Prospective companies want to see the qualities you have and what you can do for them. Just give them what they want and they will read your career change resume. This sample cover letter shows you format and content of career change cover letter that works. You may want to compare it with a standard cover letter format and a sample cover letter for chronological resumes. 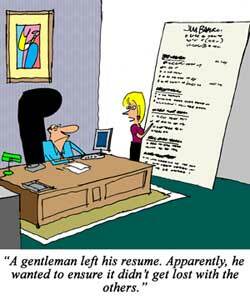 One essential element of a résumé is resume objective. This resume objective sample shows examples of good resume objectives for career change. You can compare it with the resume objective examples of chronological resumes to see their differences. Resume examples are useful for helping writing your own resume. These sales resume and accounting resume are examples of chronological resumes. You can use the ideas for creating any combination resumes. The ten resume tips show you how to avoid common mistakes when putting your résumé together. These resume writing tips also warn you not to inflate your experience. You can elaborate on your skills, but do so in an honest and ethical way. Executive resumes explain tips for writing a résumé for executive positions. It suggests you to put emphasis on accomplishments and not just accountability. For such a complex resume professional resume writing service can save your time and efforts. They can help you to write a professional resume that gets called for job interviews and even higher salary. Teaching is your current profession and you want to change career to a sales job? This sales resume for a teacher career change shows you how to create one. Want to seamlessly integrate your transferable skills into your career change resumes? Read the tips for writing a career change resume. Structure your résumé using the tips on how to write a résumé.